October is breast cancer awareness month, and if you are looking for a way to support research efforts to find a cure, I've got you covered. This is a win-win situation because not only do you get something for your money, but a donation is made also to support finding a cure. 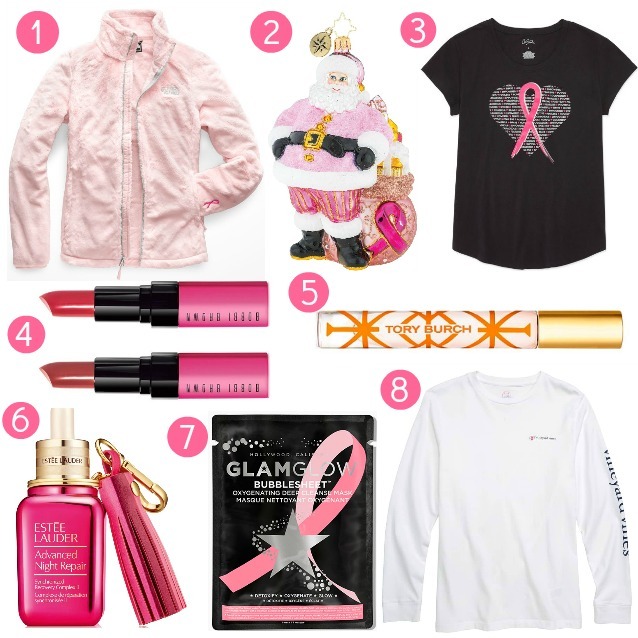 Here are a few of my favorite items that support various BCA organizations. 1. The North Face Pink Ribbon Osito Jacket - The North Face's classic fleece jacket with a charitable bend. A portion of the proceeds of sales go to Boarding for Breast Cancer. 2. Christopher Radko Ornament - Some of my favorite ornaments in my own personal collection are made by Christopher Radko. These artisanal glass ornaments are handcrafted in Europe using Renaissance-era carving, glassblowing and finishing processes. Celebrate the cancer fighters in your life by gifting this ornament or hanging it on your own tree. 3. Breast Cancer Awareness T-Shirt - A chic t-shirt that helps you show your support of an important cause. 4. Bobbi Brown Lipstick Duo - Think pink and support The Estée Lauder Companies' Breast Cancer Campaign with this set featuring two iconic, semi-matte lipsticks that deliver full-coverage color in a single swipe. For every duo purchased now through March 31, 2019, Bobbi Brown will donate $17 to the Breast Cancer Research Foundation, up to $100,000. 5. Tory Burch Breast Cancer Awareness Rollerball - Tory Burch has created a special limited-edition pink fretwork sleeve for her signature Eau de Parfum Rollerball. A bright and complex mix — in a super-chic rollerball. n support of the Estée Lauder Companies' Breast Cancer Awareness Campaign, Tory Burch Beauty will donate 20% of the suggested retail price from the sale of this product, with a maximum donation of $25,000 to the Breast Cancer Research Foundation® from 9/1/18 to 12/31/18. 6. Estée Lauder's Advanced Night Repair Synchronized Recovery Complex II - The same fabulous product, just in a limited edition presentation featuring a pink bottle and key chain to bring awareness to breast cancer. For each purchase of this product, Estée Lauder Companies will donate 20% of the suggested retail price to The Breast Cancer Research Foundation®. 7. GLAMGLOW BUBBLESHEET Mask - An oxygenating deep cleanse mask with Green Tea TEAOXI® works to reveal glowing, deeply purified skin in just three minutes. GLAMGLOW will donate 20% from the purchase price of each BUBBLESHEET mask, with a maximum donation of $50,000, to the Breast Cancer Research Foundation from 9/1/18 – 12/31/18. 8. Vineyard Vines Breast Cancer Awareness T-Shirt - Join the fight in this soft cotton T-shirt featuring a pink ribbon over the signature VV whale logo for breast cancer awareness.